As I drive to work, I begin to come down from the “mountaintop” as I consider how I must leave this wonderful, spiritual experience and sit at my desk in front of an excel spreadsheet to do my job. Is this truly my purpose in life?? I suppose people in all professions ask this question. Can occupation also be vocation? (Vocation defined as a strong desire to spend your life doing a certain kind of work, often a divine call with a religious purpose.) People with far less glamorous jobs than myself – like picking up trash or fixing toilets – probably ask this question too. But I think their role in society is more important than accounting. I recognize that these focused, deliberate times of reflection, writing and prayer would be less special and meaningful if that is how I spent my entire day. 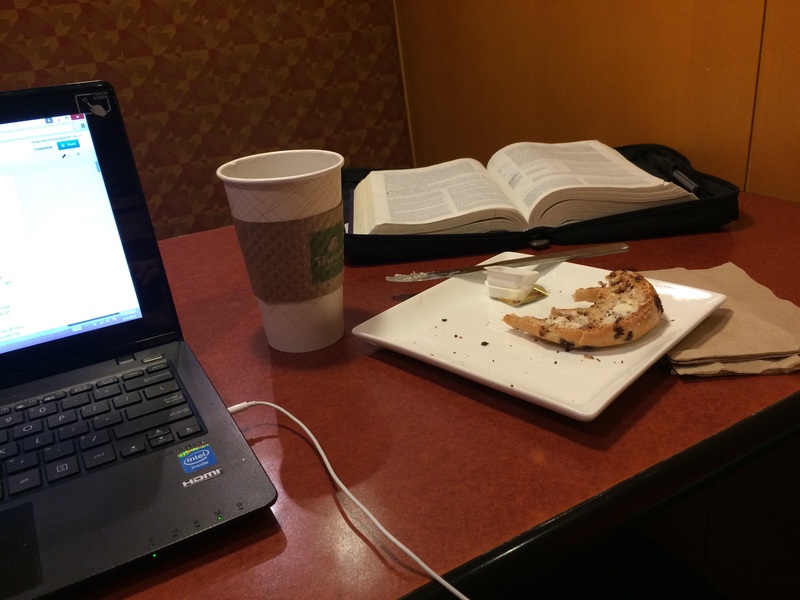 Panera would become my workplace – on top of the fact that I would go crazy from the insane quantities of Panera coffee I would consume. My 6-year-old and I have discussed this concept after breaks from school. When we’ve had a long break or a particularly fun family weekend, he is often sad when we all have to go back to work and school on Monday morning. But I tell him (and myself) that if each and every day was filled with fun, family outings they wouldn’t be quite so special. I so greatly admire the people – pastors, church leaders, doctors, teachers – who have found vocation. These people get up every morning for work – just like me – but they can easily correlate their role in the world each day to a fulfillment of divine purpose. I worked in ministry for only a short time early in my adult life. I spent my summers as a church camp counselor during college. Every day was filled with God moments – I witnessed God at work in the lives of kids and in the lives of my fellow camp staff. Then I spent a year after college working in the office at this same camp. I was amazed at how quickly it became a job. Of course I could see the mission and ministry at work, but daily tasks became just that. I made copies, helped with registrations – and in the midst of it all, often lost sight of what it was all about. And then, in my very own God moment sitting alone at Panera, I remembered the very first song I had heard that morning. When my alarm goes off, we have it set to music; to a local Christian music station. I usually hit the alarm clock too fast to actually hear the song. But on this particular morning (after I had violently turned off the interruption to my slumber) my husband commented that he liked the song – hadn’t heard it in a while. So I turned the radio back on. This was completely against our routine…. God knows my internal struggles. God hears my pleas to define my purpose. And I’m thankful that on this day God spoke through music. God is at work in me and through me; all day, every day; now and forever.